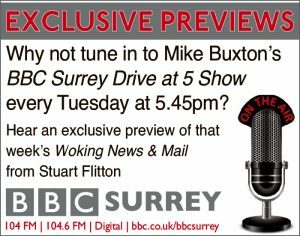 RESPLENDENT sunshine beamed down on Woking on Sunday, blushing the blaze of blood red poppies adorning the droves who had flocked to the town centre for the Service of Remembrance. 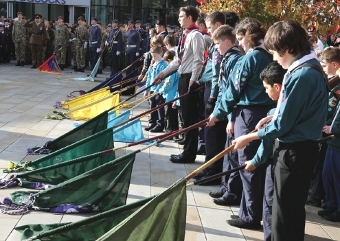 While organisations – such as the Royal British Legion, the Salvation Army, current and former Armed Forces men and women, Cubs, Scouts, Beavers, Brownies and Cadets – assembled outside the HG Wells Centre on Church Street East, the Mayor’s Procession formed at the Civic Offices in Gloucester Square. 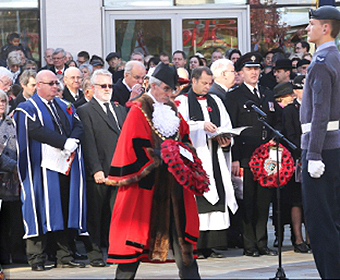 They all paraded into Jubilee Square before gathering around the Woking War Memorial for the service, conducted by the Rev Dr Peter Harwood. 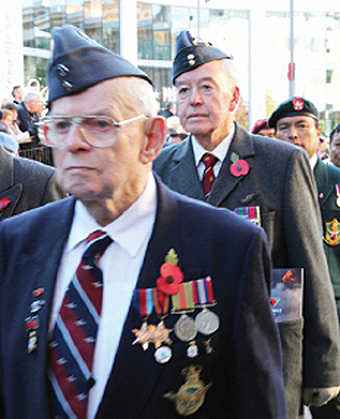 Among the many local dignitaries were Mayor Tony Branagan – himself a former soldier – and his wife Mary; Jonathan Lord MP; the Chief Executive of the borough council Ray Morgan, and its Leader John Kingsbury; Councillors Linda Kemeny, Saj Hussain, Will Forster, Hilary Addison and Graham Christie; Imam Hashmi from Woking’s Shah Jahan Mosque; and James Mackay from Churches Together. Yamna Eljamaly of the Woking Youth Council recited In Flanders Fields, a poem about the First World War, after which poppies became so poignant. 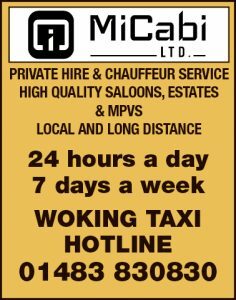 The British Legion’s Bill Moore recited the Exhortation, while Ian Fraser, Chairman of Woking’s Royal Naval Association read the Kohima Prayer. The Last Post signalled a sound of silence which shrouded the square for the two-minute observance in respect of those who lost their lives in the line of duty. 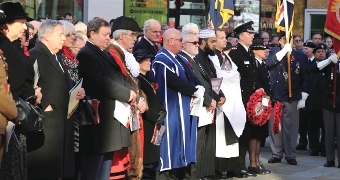 When the bugler sounded the Reveille, Mayor Branagan laid the first wreath, followed by the Royal British Legion’s Mr Moore, Mr Lord, the regular forces units, service organisations, and other local groups. The Bisley Ladies’ Choir accompanied the wreath-laying before the service concluded.